It seems that a lot has been written about the health benefits of some berries, such as blueberries, while other berries have been neglected. This study focused on red raspberries, black raspberries, and blackberries. 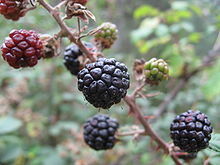 While the study was done in Poland, it was pointed out that these berries are also commonly grown in the USA. Red raspberry, black raspberry, and blackberry fruits are abundant in dietary phytochemicals such as flavonols, phenolic acids, ellagitannins, vitamins C and E, folic acid, and β-sitosterol. Many of these bioactive compounds exhibit antioxidant activity. Anthocyanins and other phenolic compounds such as ellagitannins and ellagic acid, which distinguish raspberry from other berries, occur in high levels and are mainly responsible for their broad beneficial health properties (including anti-inflammatory, antimicrobial, and antiviral activities). As far as healthy foods go, berries make the top of the list. They contain potent antioxidants, which decrease or reverse the effects of free radicals -- natural byproducts of energy production that can play havoc on the body and that are closely linked with heart disease, cancer, arthritis, stroke or respiratory diseases. Unsurprisingly, the benefits of berries are extoled in one study after another....The research published now in Open Chemistry suggests that black raspberries grown in Central Europe show greater health benefits than their better known cousins -- raspberries or blackberries. A group of researchers led by Anna Małgorzata Kostecka-Gugała measured the content of phenolics and anthocyanins in black raspberries, red raspberries and blackberries, assessing their antioxidant potential and health benefits. They were able to confirm that the antioxidant activity of natural products correlates directly with their health promoting properties. It turns out that the amount of antioxidants in black raspberries was three times higher than the other fruits under investigation. Remarkably, the number was even higher for phenolics or the amount of anthocyanines -- with black raspberries topping their humble cousins by over 1000%. But most interestingly, black raspberries seem to be characterized by a higher content of secondary metabolites, which have been proved beneficial for human health.